Sometimes, the words will come to me; the words that I need to read, to hear, are found. These words are not meant for me, but when I stumble upon them, they resonate with me anyway. Oh yes, that is me – ‘so preposterously serious (these) days’ – and so…. See? I tell you…these words are subtle reminders; good advice for folks like me who allow themselves to drown in their emotions far too often. 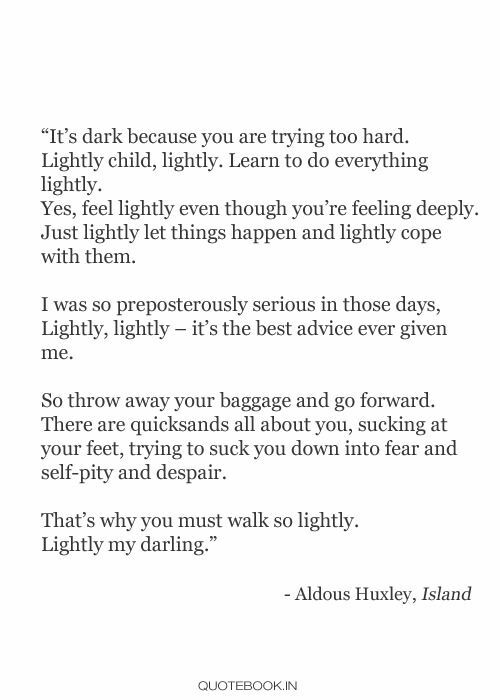 Tags: Aldous Huxley : emotional : Island : Lightly lightly : MfL : not waving but drowning : preposterously serious : quotable quotes : that's me.